The perfect look and quick processing time are the most important criteria for professional joiners when it comes to choosing which silicone sealant to use. This applies particularly to adhesive and sealant applications on tiles, ceramic and in sanitary area as these joints must meet particular standards. This is why OTTO offers sanitary silicones with good weather, age and UV-resistance as well as very good adhesion to ceramic surfaces. Sanitary silicones also contain fungicide and bactericide to prevent mould formation. In order to meet visual standards, the sanitary silicones are kept stocked in a range of colours, particularly the premium sanitary silicone OTTOSEAL® S 100 with 81 different colours. Current colour trends such as wood-effect tiles are incorporated into the product range as quickly as possible. This variety of colours and the sealant's unique processing characteristics as well as excellent surface smoothability make OTTOSEAL® S 100 the number 1 choice for sanitary areas. Sanitary silicones by OTTO are perfect for sealing moving joints in sanitary areas (e.g. 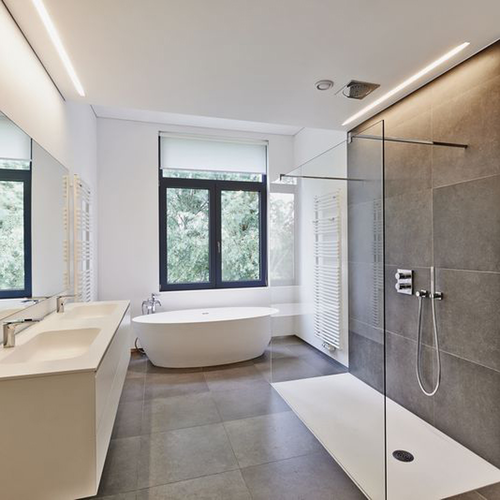 on bath tubs, shower trays, wash basins and toilets) to ceramic tiles and panelling. OTTO also keeps suitable sanitary sealants in stock for demanding sealant work such as joints in the grocery and drinking water sectors, moving joints underneath terracotta surfaces or joints in the swimming pool and underwater sector. The OTTO product range for sanitary areas is completed by the OTTOFLEX system for full-surface seals in sanitary and wet rooms. Colour recommendations for colour comparisons of OTTO sanitary silicones with the many grouted joint manufacturers such as PCI.